For this industrial robot, each day was the normally exactly the same as the last, until by chance someone discovered an amazing and hitherto untapped talent. Now, just like in the movies, this robot has rocketed into stardom and is enjoying its 15-minutes of fame. Here’s what the ‘bot can do: With a digital camera mounted on its arm, it snaps its subject’s picture, then by using edge-processing software converts that person’s face into co-ordinates, ready to be transferred to paper. 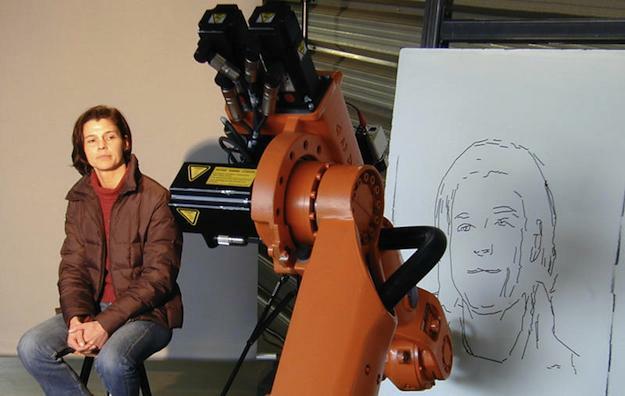 Equipped with a pencil, the robot proceeds to draw a line-based portrait. Once the masterpiece is finished, it’s picked up and proudly displayed to onlookers, before being erased ready to start the next picture. This is quite different to this robot’s regular job, which involves testing degrees of light reflection on safety equipment. Now, having escaped the confines of the lab, the robot can be found drawing its pictures on the Fraunhofer Institute’s stand at the CeBIT show in Germany, and was developed by artists and scientists in the Robotlab at the Center for Art and Media. As proud as the robot looks as it shows-off the completed work, not all its subjects have been pleased with the final result. Despite being equipped with the ability to ignore some imperfections that could stop the picture from looking realistic — tiny lines around the eyes for example — it’s still a robot, and flattery doesn’t come into the equation. Therefore it records each and every laugh-line and wrinkle it’s able to see, and can’t choose to emphasize striking features which normally make pictures look more natural. What it sees is very much what you get. Described as “an interface between art, science and technology” by one of the scientists involved in the project, the actual drawing process has been slowed down to around ten minutes, in order to more closely resemble the experience of visiting a street artist in Monmatre, France. Being very big and very orange, the robot would certainly standout should it ever work along those cobbled streets.